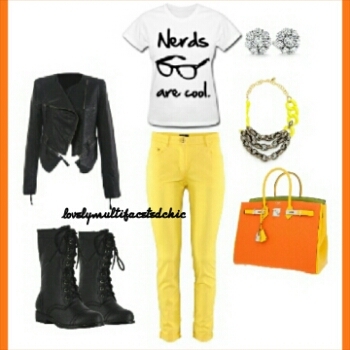 Style Inspiration: Fly Nerd – Lovely.Multifaceted.Chic. I created this trendy Spring look using a cute t-shirt. I chose yellow jeans and accessories that complemented the jeans. Also, I added the faux leather jacket and boots to bring a little edge to the look. I chose stud earrings to balance the statement necklace. I would totally rock this look for a day-to-day look or for the weekend if I don’t want to get super dressy but want to look good. ***By the way, the app I use to create my looks are My Dressing. You can use it to organize your own closet.